There has been a growing acceptance over the last few years that health care, like other human services, should be subject to evaluation. It has been suggested this should not only involve measuring medical outcomes, or economic efficiency, but also whether services are socially acceptable.1 It is this latter aspect, together with the experience of mental health problems, which is the concern of this book. Our central question is this: to what extent are mental health services acceptable to the people who use them? Before going on to address this question in the following chapters, we need to set the scene by putting our study into a wider context of research on the ‘patient’s view’. 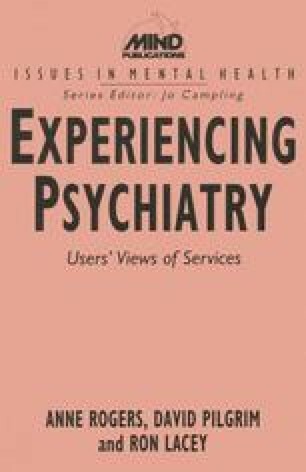 Some of this, particularly about psychiatric patients, has reflected professional interests and has failed to take the critical implications of users of services seriously. Let us start by reviewing briefly research on non-psychiatric patients.